If you’re like I used to be, you try to get some exercise occasionally. Actually, my efforts constituted more than trying for several years. I rose before the sun at least four mornings a week on good weeks, stumbled into my car, and drove to my friend’s house hoping that my light knocking on her door wouldn’t wake the dogs. I often felt that our trudging through the dark streets, sweating up one hill and huffing down the next had little effect. Of course, my stamina had definitely improved, I no longer wheezed when trotting up the stairs, and most of my clothes fit better. Unfortunately, the scale and I haven’t had an amiable relationship for years, so I rarely factored its results into my evaluation about whether my toiling was having any kind of noticeable effect. The last seven months of no exercise have taken their toll. Although I’ve chosen to completely avoid my scale so can’t have the bad news confirmed, and my clothes haven’t quite taken on the appearance of a wet suit, I’ve begun to puff when I walk up stairs again. My knees hurt, and my feet feel as if they’re carrying around a pack mule’s load. So with little fanfare, and conscientiously avoiding any talk of a resolution, I’ve promised myself to take better care of my body. I know how to do this and so I will. It doesn’t mean giving anything up; it means paying attention to what I eat, and how much. It also means I have to get out of bed before the sun at least four mornings a week. My good friend will join me two of those days, and I’m hoping I can get my husband to at least think about it on the other two. In the meantime, indulge me my veggies. 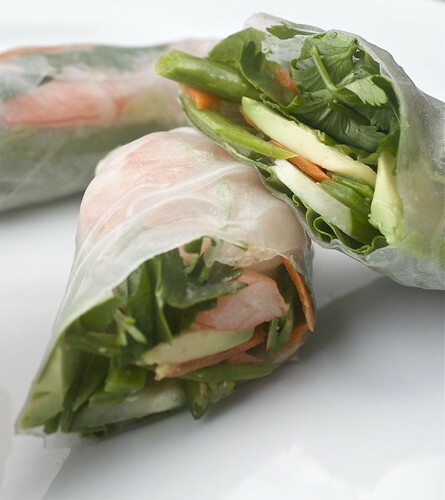 Have you ever made spring rolls with rice paper wraps? 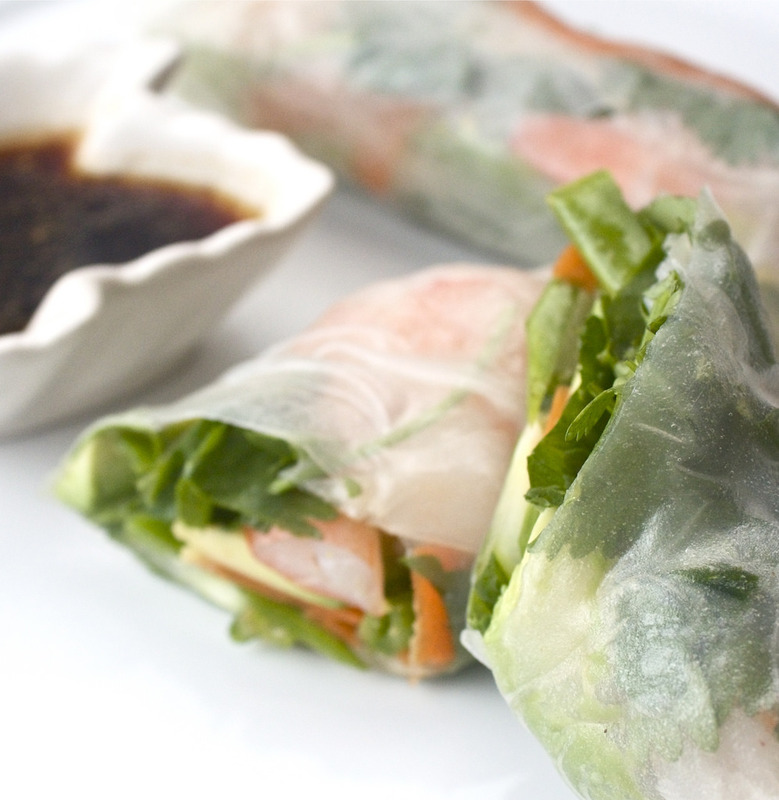 To prepare the spring roll wrappers, layer a few paper towels onto the counter and dampen them. Pour warm water into a wide-bottomed bowl. The water should be very warm, but not so much that you can’t dip your hand into it. Place one of the wrappers into the water to soften completely, about 15 seconds or so. Remove to the paper toweling. 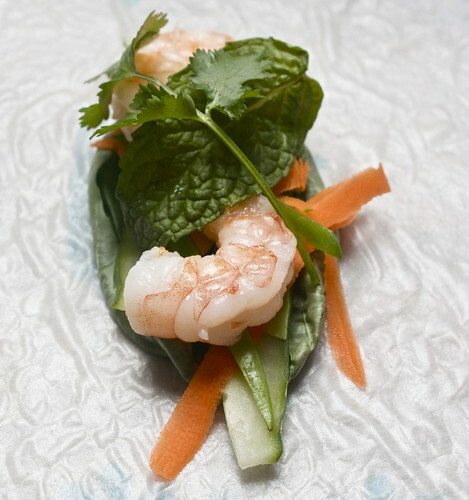 Layer basil first, then the vegetables, followed by a couple of shrimp, then the mint and cilantro onto the wrapper. Fold one portion over the filling tightly, fold in the sides, then roll snugly until completely wrapped. Cut in half, dip, and crunch away. You can find the spring roll wrappers at your local Asian market, or if you’re lucky, Whole Foods. 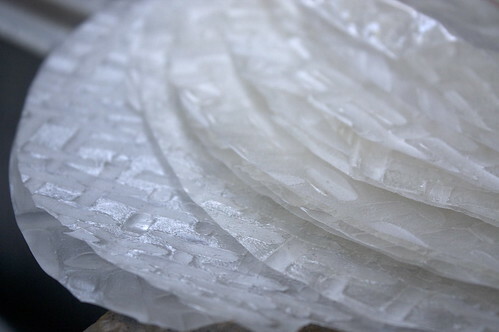 They’re made of rice, salt, and water and can be delicate until you get the hang of softening them in the warm water. It’s fun to change the fillings to whatever you enjoy. I like loading them with fresh, raw veggies because they’re so healthy, and quite filling. Two or three are plenty. The dipping sauce is fun to play around with as well. Mine is an adaptation of a salad dressing I got from the back of a bag of soy bean sprouts. We’ve tried a peanut dipping sauce which is also good. If you’re thinking about calories and counting on this, the wrappers are about 30 calories each. Not bad. Not bad at all.